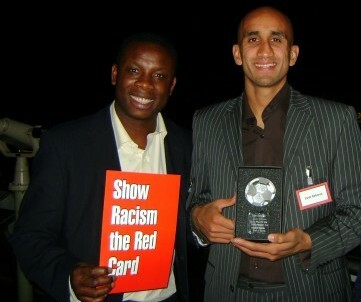 Show Racism the Red Card caught up with our Hall of Fame member Zesh Rehman who was told that his Pakistani background would prevent him from making a career in football. The former Premier League defender has proved anything is possible and is now inspiring a new generation of people and Asian footballers through his success in Asia. Zesh Rehman, 28, one of SRtRC's most long-standing ambassadors is currently plying his trade with Kitchee SC in the Hong Kong Premier League. Six months into his new surroundings with Kitchee has seen Zesh be an ever present in a conquering season which saw him lift the Championship title, win the domestic League Cup and FA Cup, and reach the last 16 of the AFC Cup, which was a record for Kitchee SC. “I am really enjoying life out in Hong Kong. There is a fantastic set-up at Kitchee and the standard of football is very good. It was such a good feeling to win my first trophy as a professional footballer, but then to go on and do the treble was an amazing feeling - and it has given me the bug to win more. “It’s great to be playing in a winning team with confidence so high. We play an attacking brand of football under the guidance of former Barcelona Youth Coach Josep Gambau. We welcome Arsenal in July during pre-season at the Hong Kong Stadium and I look forward rubbing shoulders once again with one of the top teams in Europe. It will be a tough game but if we can carry on the momentum I’m sure we will give them a good game”. “Firstly I have received many phone calls and emails from various Asian media asking my views and opinions regards to the Terry incident and now Rio’s omission from the England squad and what impact theses issues have on aspiring British Asian players, coaches and the parent’s who may want to gear their child towards professional football. “For those aspiring BME players and coaches pursuing a career in the game and their parent’s supporting them, they should not be deterred from any negativity in the media but remain resolute in their pursuit of entering the footballing industry albeit as a player, coach, groundsmen, media, refereeing, administration or even as supporters in stadiums. “As a young player coming through the ranks Rio was a role model of mine and based on his ability alone he should be in the England squad for sure. For someone who has played at the top level for so long and performed for England on a consistent basis, to then be overlooked is disrespect to a respected figure in the game. “Much has been said about recent racism in football and what barriers Asian players and coaches face but there in not just one underlying factor it’s a combination of several social issues and ignorance which stems from a lack of education”. Off the pitch Zesh continues to inspire a new generation of young people into the beautiful game both in the UK and internationally. Kitchee SC has found a new set of fan base since Zesh’s arrival at the club and Zesh has been overwhelmed with the support. “It is always nice to see the smiles on people’s faces at matches. The Islamic Trust has been a focal point of Hong Kong for years but to now see students, teachers and families attend matches on a regular basis for the first time since my arrival is great. Football has the power to bring people together from all corners of the world”. Now back in the UK till the end of June, Zesh will not get much of a rest due to his charitable work through the Zesh Rehman Foundation (ZRF) and other charitable and Football Governing Bodies. “It’s been non-stop since I landed back in the UK. I was invited over to Ireland as a guest speaker on the Irish FA/UEFA Pro License to talk about the Asia Market for current and future coaches and managers who will go on to manage at the highest level of the game. “Coaching and management is something I see myself going into in the future and to be mingling with experienced professionals at such a young age will hold me in stead for the future and hopefully inspire a new generation of Asian coaches”.